The site of an ancient Maori settlement and New Zealand’s oldest city, Dunedin on the South Island bursts with creative energy and natural splendor. Straddling both a sheltered harbor and a stretch of wild Pacific coastline chock full of wildlife and scenic vistas, this small university town has gained a reputation as an ecotourism hotspot. The New Zealand music scene has been defined by the “Dunedin Sound” since the early ’80s — lo-fi, garage jangle pop coming out of the city via Flying Nun Records. The Clean helped create the Dunedin Sound with their single “Tally Ho” in 1981, the second song ever released from Flying Nun. Despite many stops, starts, and lineup changes along the way, they’ve been part of its evolution ever since.Check out the video for the 2009 release “All Those Notes” here. I Survived a Zombie Apocalypse, to be released in 2014, is an indie horror-comedy set in Dunedin and written and directed by local Guy Pigden. When real zombies invade the set of a zombie film shooting in the wilderness, and no one knows who’s an extra and who will actually eat their brains, all hilarious hell breaks loose. Watch the official trailer below. Dunedin native Janet Frame, who would be 90 this year, is New Zealand’s most celebrated author. In her many years at home and abroad, she wrote 11 novels, five short story collections, poetry, and a children’s book. Frame’s working class upbringing darkened by family tragedies, adult years in and out of lunatic asylums, and final liberation through writing and travel were recorded in three volumes of autobiography, later adapted for the screen in Jane Campion’s masterpiece An Angel at my Table.An extended review of Between My Father and the King: New and Uncollected Stories, published posthumously in 2012, can be found here. A traditional dish, the “boil-up” combines pork, stock, potatoes, sweet potatoes or pumpkin, watercress, and dumplings for a heaping plate of savory goodness. Sound tasty? Try this recipe. Baldwin Street, in the inner suburb of Northeast Valley, holds the Guinness World Record for the world’s steepest street. This landmark has led to all kinds of mad kiwi fun. 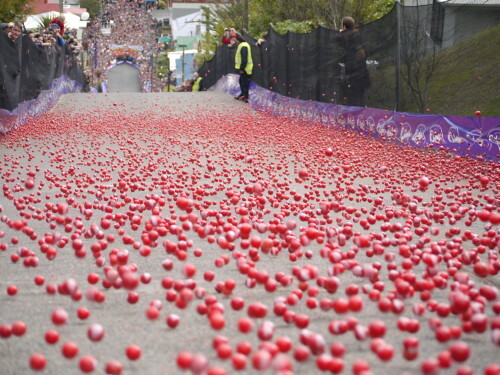 In the annual Baldwin Street Gutbuster, runners race the grueling thousand feet to the top and back down again. Every July during the Cadbury Chocolate Carnival, 30,000 small round chocolates are rolled down Baldwin Street for charity in the Jaffa Races. And each chocolate is numbered, so there actually is a winner.